I now have proof that being a bit untidy in the garden does have some benefits. This lovely bee balm (Monarda) is growing next to the compost bins in the vegetable garden. I didn't plant it, it just decided that it would grow there. I let it be, I did not tidy up that area, and my reward is these bright pink flowers. So, there you have it, proof that being a bit untidy in your garden does reap rewards. By the way, I have never seen this color in any of the bee balm I planted on purpose in my perennial beds. What I planted was all a very washed out light pink, not too showy and I never saw a hummingbird come near it. In fact, I had for the most part "weeded out" the bee balm I planted on purpose because in addition to the washed out color, it was too good at self-sowing, and that is the last thing I need right now, something else that is a good self-sower! So, if you are a gardener who is working toward a completely tidy garden, ease up a bit. 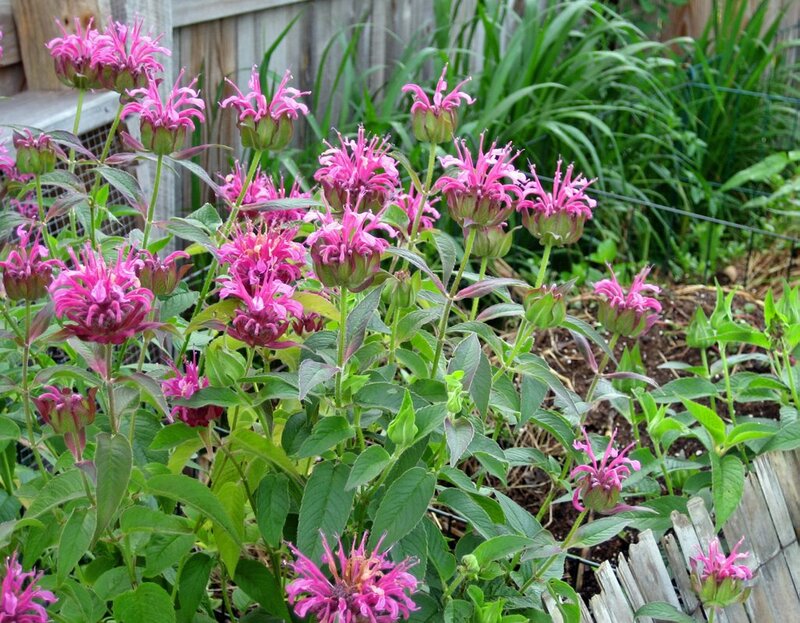 You may be pulling out something that turns out like this bee balm. I have offered you the proof you need to allow yourself to be untidy! Be a bit of a slob, let some plants grow and see what happens. You might get a nice surprise. 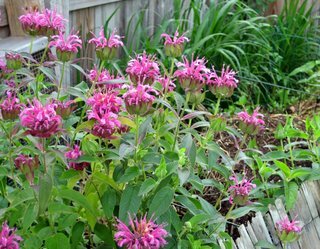 I love Monarda, and yours is beautiful. Your blog is fun to read. I have used your link for Moon phases - it is a lovely thing as well. Deborah. Your monarda looks good. I have also plants, that come alone and can stay! If the colour is good. i have bee balm growing in my yard, red bee balm. i got the seed in wild flowers seeds our bee balm that grows wild here is purple. maybe a bird visited me and then went to your yard!